The Coronado is built around a proven Freightliner core, with the addition of advanced technology and plenty of enhancements. We've built it strong enough to go off-road – making on-road driving a dream. It's a muscular, reliable, multi-purpose highway specialist with commanding good looks. With a huge stainless steel grille, square bonnet and stylish chrome air intakes, the Coronado will make you proud to get behind the wheel every day. But this truck has much more than an attractive exterior. It's the perfect on-highway hauler. With the choice of two leading US engines with eight option ratings to 600 hp, the Freightliner Coronado can deliver big loads easily, and its low tare weight allows for a larger payload which can result in greater revenue. 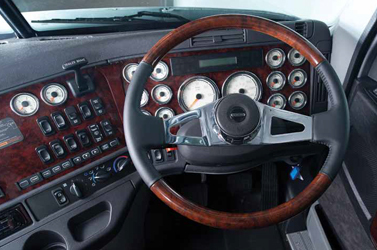 Of course, like every Freightliner, the Coronado puts a priority on driver safety and comfort. The cabin exceeds European safety standards (ECE-R29) and is more spacious and driver friendly. A great looking, hard working, profit machine: the Freightliner Coronado is simply the best thing to enter the Australian transport industry in years. 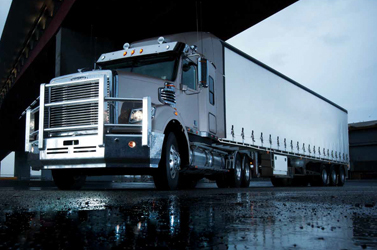 Every aspect of the Freightliner Coronado has been designed to make it the perfect truck for on-highway applications. Whether you're doing local, single-trailer distribution work or a major B-double line haul job, the Freightliner Coronado will do it effectively and efficiently every single day. 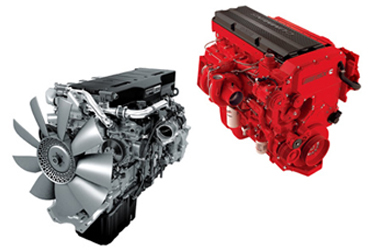 There's an engine available for any role, with the choice of either the Detroit Diesel DD15 or Cummins ISX powerplants with power options ranging from 485-600 hp. Both engines are fully ADR80/03 compliant and can be upgraded without changing engine hardware. 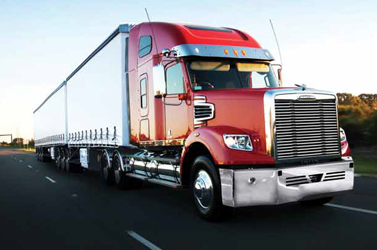 With all that power the Freightliner Coronado can be rated for 106,000 kgs Gross Combined Mass for general highway use. On long trips, getting a good night's sleep is all-important for safety and efficiency. 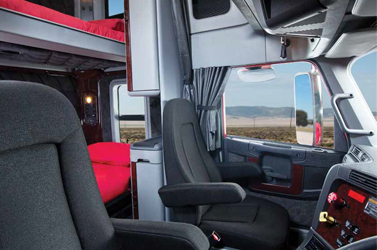 In the Coronado, sleeping is easy with the cab and sleeper packed with noise abatement material in the floor, front wall, sides and back panel. A separate control panel can adjust the heater, airconditioner and lights. Strategically placed cabinets maximise storage space and a stow-away bunk in the 58" raised roof model provides extra bed space when it's needed. A clothing rack and pull-out writing surface make life easier, and there's a perfect spot for a TV. The front cab mounts use a 'pillow block' design which effectively isolates vibration and shock from the road, while the rear mounts feature air springs mounted outside the frame rails. It all means a smooth, stable ride with the driver getting a great 'feel' for the road. The interior features Oregon burl wood trim. The durable two-tone dash has ivory coloured gauges with bright bezels and the attractive interior trim comes in either studded vinyl or cloth. Large rigid doors have double seals for superior insulation and noise reduction. Vision is excellent thanks to large side windows and rear view mirrors. And one of the best air-conditioning and heating systems in the industry will keep the driver and any passenger feeling comfortable and relaxed. A truck is only doing you good when it's on the road, so we've designed the Freightliner Coronado for high performance with minimum downtime. The bonnet tilts almost 90 degrees so accessing the engine for maintenance is easy. It's also a great help for daily checks of coolant, power steering fluid, and windshield washer fluid levels all throughout transport reservoirs. There's no strain either, with the Coronado's bonnet tilt mechanism reducing the lift effort to a mere 20 kgs. The bonnet itself is made of fibre glass, so if ever necessary, it's easy to repair with 'parting lines' to assist body shops. The bonnet guards are reinforced with impact absorbing material to help eliminate damage and 'star' cracks. 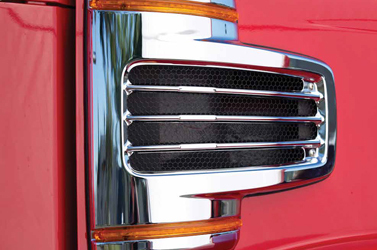 The truck's stylish headlights are far superior to traditional designs, with a single high-tech reflector providing excellent front and side illumination. No tools are needed to change bulbs, just tilt the cab and pop one in. The windshield has been designed in two-pieces, to make replacement easier and cheaper. The electrical wires are numbered and colour-coded for easy maintenance. To work hard you have to be able to breathe, whatever the weather is like outside. The two air intakes on the side of the bonnet are both attractive and highly functional. Aerodynamically shaped, they minimise the intake of water, dust and debris, significantly extending the life of the main air filter. Beneath the Coronado's gleaming grille sits a massive 1,900 in engine-mounted radiator, large enough to handle the hottest conditions with reserve capacity.